When Amanda Baxley Kalinsky was 25, she took a special test to determine whether or not she had a neurodegenerative disease. It is a kind of prion (a brain protein) disease called Gerstmann-Straussler-Scheinker (GSS), similar to Creutzfeldt-Jakob disease (CJD), a more prevalent but no less fatal brain disorder. There is no cure nor treatment. It is hereditarily spread. In Kalinsky’s family, it took her father, uncle, grandfather, great aunt and a cousin. Death comes in middle-age, slow and debilitating, eating away at one’s abilities in a piecemeal fashion. Offspring have a fifty-fifty chance of inheritance. There are less than 60 known families affected. 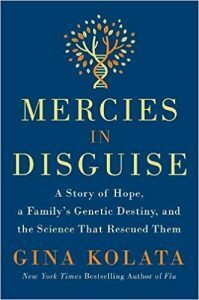 The cover of Mercies in Disguise, which tells the story of Amanda and her family’s battle against Gerstmann-Straussler-Sheinker, a rare prion disease. Kalinsky has the disease. She now knows, with near certainty, how she will die. But though there is no known way to treat it, there are ways to fight it. To help in finding a cure, she made herself a human guinea pig for prion-focused research studies. She became a board member of the CJD Foundation. Through in vitro fertilization, she and her husband helped insure that the disease will not pass to her children. All of this is documented in a recent book on Kalinsky’s struggle, Mercies in Disguise, which grew out of an article done by New York Times reporter Gina Kolata. We spoke with Kalinsky to learn more about her story. Can you speak a bit about what this disease is and how it came into your life? Gerstmann-Straussler-Scheinker is a neurodegenerative disease. The prion proteins mutate and are responsible for causing these diseases. The form that I have is hereditary. I am the sixth generation of the family to have it. What happens with GSS is, once the prion proteins have mutated and clogged up the brain over a course of many years, you start having symptoms. It eats away at the brain; it causes holes in the brain and you start having symptoms. My family members have been in their late fifties when they start having symptoms. 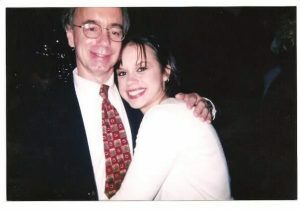 Amanda Baxley Kalinsky and her father. It becomes hard to walk; you start stumbling, losing your balance. Then you start being unable to sleep. Then you start losing control of your muscles. My dad started having trouble talking. He started stumbling and falling, hitting his head. Then he started having trouble swallowing. It was really, really hard for him to eat, so much so that we would have to purée all his foods. Then he started communicating with an alphabet board because his tongue and vocal chords stopped working. Then he became pretty dependent and was in a chair, in a La-Z-Boy. It gradually got worse and worse until he was in a hospital bed and passed away after six years of suffering with this disease. So that’s the gist of it. It’s not pretty. And it’s very rare and not a lot of people have heard of it. Whenever I got old enough to realize what was going on, I knew that it was obviously hereditary in my family. I thought, ‘Well that means that I have a chance of having it, of developing it in middle age.’ So I found out about a blood test I could take to determine whether or not I had this mutated prion protein in my DNA sequence. I said, ‘If I have this, I don’t wanna have my own children. I don’t want this disease to continue, to take people away, to kill people in my family.’ That was my main reason for being tested. I was finishing up nursing school. I was dating Bradley, my current husband. I was in Charleston, South Carolina. How’d you find out about the test? My father and uncle and grandfather all were involved in a research study at University of California, San Francisco that was being led by Dr. Michael Geschwind. Part of the study was this blood test. 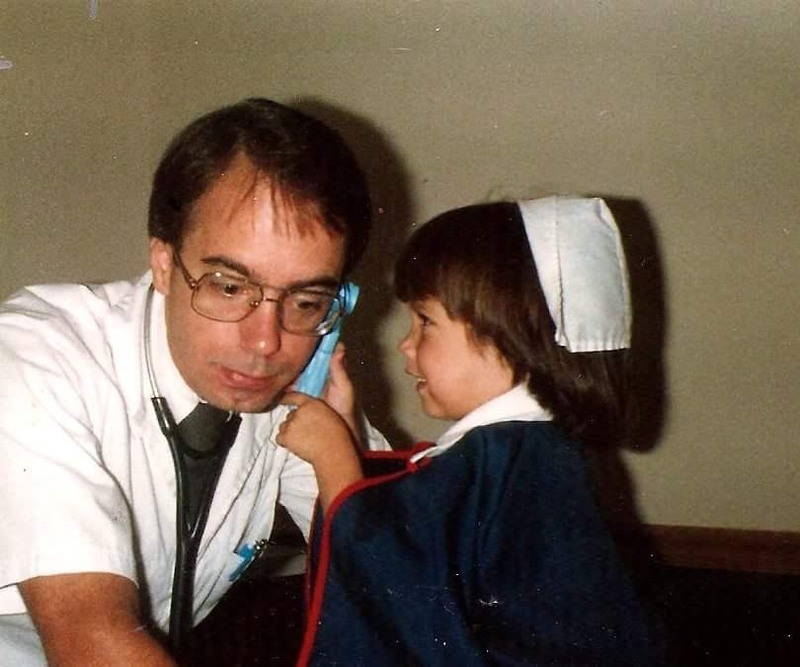 Amanda playing nurse with her father as a little girl. What was the decision to get the test done like for you? If something is wrong, I want to fix it, or help fix it. I don’t want to run from it. That’s just who I am. I contacted Dr. Geschwind. I went to California, got all the testing done. Then there was this time lag that I had to figure out how to wait for these answers which could change the rest of my life. Eight weeks till I find out yes or no. I’d just graduated nursing schools, had no job yet. I said, “I’m gonna travel by myself. I’m gonna go to Africa.” That was a real turning point in my life. It saved me. How did you hear the results? One of the requirements for this research study I was in was that when you found out the results you had to be in your psychiatrist’s office. We were put on speaker phone. I was in my psychiatrist’s office in Columbia. Dr. Geschwind was on the other line with his team’s genetic counselor. He opened the letter for the first time over the phone and read the results to me. He didn’t know them either. I was there. Brad, my mom and psychiatrist. That’s how I found out. The next day Brad was there he took me to one of our special places in Charleston and proposed. He said, “You and I are together. We’re gonna get through this together and do it together.” That set our path. “We are on this together. “It’s gonna be okay.” We started our journey to fight back against it together. What does “fighting it” mean to you? 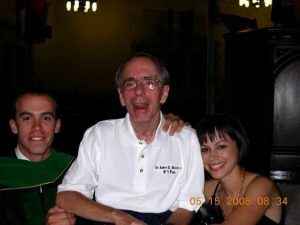 Amanda, her father, and her brother, who did not inherit the disease. There’s nothing I can do to take away the fact that, unless something else kills me first, this is going to be the way that I go. I can’t change that. I just can’t. But I can make the best out of a really crappy situation. What I mean by fighting back against it is by becoming more involved in research studies, being a guinea pig for these scientists who are devoting their careers to figuring out a treatment or a cure to these kinds of diseases. I’ve given skin samples, blood, tissue. I’ve had multiple trips and interviews and neurological exams. I am okay with being poked and prodded all in the way of finding a cure or treatment. And I want to be a voice of hope for people who are going through a situation like I went through when I was 25. It’s hard. You feel so alone because nobody’s heard of this disease, nobody’s seen it. When you find somebody that has, it’s huge. I wanted to be that person for someone else. I got involved with the CJD foundation. I am now their reproductive options consultant. I talk to families trying to figure out how to deal with this diagnosis. They want to have kids but they don’t want to pass it on. You feel so alone because nobody’s heard of this disease, nobody’s seen it. When you find somebody that has, it’s huge. I wanted to be that person for someone else. Do you consider in vitro fertilization a way of fighting back, too? Yeah. I’m also gonna fight back against it by not letting it affect anybody else in my direct line of family. Yeah, it’s gonna get me. But it hasn’t gotten me yet. It’s not gonna get anybody else. I made that decision after speaking with a genetic counselor who speaks with Dr. Geschwind. We got in touch with the Reproductive Genetic Innovations in Chicago who specialize in this procedure. Long story short is what they do is you go through a basic in vitro fertilization. They harvest eggs. Then put sperm and some embryos in a lab. Then these embryos are taken and one cell is extracted. The DNA of that cell is examined. If the DNA has that mutation then that embryo is discarded. They had done this for a few years but they had never done it for a prion disease before. I was the first person to do this for this type of disease. Your children have been tested again after birth? They have not. The accuracy of this procedure is 98 to 99 percent accurate. So there is that small chance. It’s a one to two percent chance. What they can do is test the child in utero or once the child has been born. They give that decision to the parents. Brad and I talked about it and we decided that we had played God enough. Yeah, it’s gonna get me. But it hasn’t gotten me yet. I’m the youngest of three. My older brother has been tested. He and his wife decided that’s what they wanted to do. But he did not have it, which is amazing. But my older sister, she doesn’t want to be tested. She has two children already and just would rather not know. What is the story behind the title of the book on your experience, Mercies in Disguise? That’s from my mom actually. Gina, the author, spent over two years on this book and she became very close with my family and I. My mom and her were having a conversation one day about the title and she said, “Gina listen to this song. It’s called Blessings.” It says, “What if your darkest nights and your strongest thorns could really be your mercies in disguise?” It just kinda hit Gina and she said, “That’s it. That’s gonna be the title.” So it’s from the song. I think it’s perfect.